Interested in joining our team? Email your resume to info@craftkombucha.com . We are looking for someone to be join our weekly farmers' market team on weekends as our driver. It is essential that you are responsible, timely, and experienced in management. It is also important that you are outgoing, friendly, and energetic. You should be flexible and able to problem solve when a situation arises. Because kombucha is still very new to many people and often requires explaining, it is important that you be knowledgeable about or interested in learning about kombucha. Responsibilities include loading and unloading the van for markets at our kitchen, driving the van to and from markets, and management of the markets themselves. Since you will be driving our van (a Ford Transit), it is important that you have are comfortable with driving a larger vehicle and have a good driving record. While working the markets, you will be expected to set up/tear down our stand, serve kombucha to customers, sample out and educate customers about kombucha, and operate the register in what can be a fast-paced food service environment. Our kombucha is served on-tap, by the keg, so there will be some heavy lifting involved. Mount Pleasant Farmers’ Market - Saturdays, from 7:00 a.m. to 2:30 p.m.
Mosaic District Farmers’ Market - Sundays, from 7:00 a.m. to 3:30 p.m.
We are looking for associates interested in working any of the following farmers' markets this upcoming season: Mosaic District Farmers' Market, USDA Farmers' Market, and the Georgetown University Farmers Market. If you’re interested in becoming a member of our booch crew, it is essential that you are outgoing, friendly, and energetic. You should be flexible and able to problem solve when a situation arises. Because kombucha is still very new to many people and often requires explaining, it is important that you be knowledgeable about or interested in learning about kombucha. The farmers' market will go on rain or shine, so a willingness to put up with the elements is key. 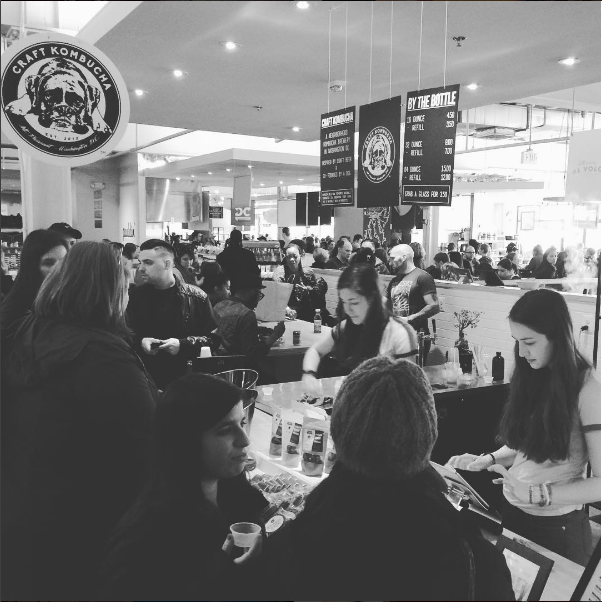 Responsibilities in this position include setting up/tearing down our stand, serving kombucha to customers, sampling out and educating customers about kombucha, and operating the register in what can be a fast-paced food service environment. Our kombucha is served on-tap, by the keg, so there will be some heavy lifting involved. If you’re interested in becoming a member of our booch crew, it is essential that you are outgoing, friendly, and energetic. You should be flexible and able to problem solve when a situation arises. Because kombucha is still very new to many people and often requires explaining, it is important that you be knowledgeable about or interested in learning about kombucha. Responsibilities in this position include serving kombucha to customers, sampling out and educating customers about kombucha, and operating the register in what can be a fast-paced food service environment. Our kombucha is served on-tap, by the keg, so there will be some heavy lifting involved. We are looking, in particular, for associates to work mornings on Tuesdays through Fridays. Our hours of operation at the market are Tuesdays and Wednesdays, from 11 a.m. to 8 p.m., Thursdays and Fridays, from 11 a.m. to 10 p.m., Saturdays, from 10 a.m. to 10 p.m., and Sundays, from 10 a.m. to 7 p.m.